As parking violations are stringently policed in Japan, be sure to park your car in appropriate parking areas or assigned lots when leaving your car, even for a short time. 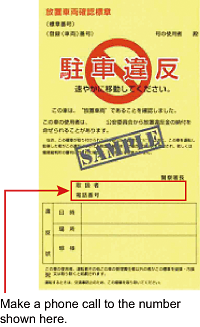 When a penalty sticker is affixed to your car, payment of a fine between 10,000 yen and 18,000 yen will have to be made (in the case of passenger cars). 1.Reporting to a police station Report to the police station indicated on the parking sticker immediately. 2.Pay the fine When you go to the police station, complete the necessary documents and you will receive a payment notice. Pay the illegal parking fine at the nearest financial institution (bank etc) and get a receipt. 3.Report to the rental car company Present the completed forms for the penalty and your receipt. Penalties may be incurred for failing to make the required notifications. You must inform the rental car company of any parking fines! When a parking fine sticker is affixed to a car, the owner is contacted and informed of the violation through the license plate (in this case, the rental car company). Go through the formalities by following the instructions of the police before returning your rented car. There are many people from other countries who violate the parking regulations in Japan. According to a survey by rental car companies, the arrest rate for illegal parking by people from abroad is eight times the rate of Japanese. Check the areas where parking is banned by checking traffic signs and lane markings. This sign indicates an area where parking and stopping is prohibited. Drivers cannot park or even stop their car on roads with this sign. The upper "8 – 20" means the restriction is applicable from 8:00 to 20:00. Parking is restricted all day if the sign displays no such numbers. This sign indicates a no parking zone. On roads with this sign, a driver cannot park the car except to let off passengers or take on or drop off things. The upper "8 – 20" means the restriction is applicable from 8:00 to 20:00. Parking is restricted all day if the sign displays no such numbers.